The Gran Hotel Camaguey was inaugurated in 1939 and has just undergone a complete refurbishment. It’s probably the best city center hotel in Camaguey at this time. Located in the nerve center of the city between Maceo and General Gómez streets, it affords guests a truly central location from which to explore this UNESCO acclaimed city. Further location attributes are its 12km distance from Camaguey’s Ignacio Agramonte international airport. The Gran Hotel of Camaguey was built in true colonial style that combines a stunning façade with intricately carved wooden interiors and fine period decorations. Amongst the hotels renowned past guests are: Mexican Jorge Negrete and Mario Moreno (Cantinflas), Cuba’s national poet Nicolás Guillén, Cuba’s most famous ballerina Alicia Alonso, Rita Montaner, Ernest Hemingway and many more. Its location affords the perfect base from which to explore the old city and surrounding attractions. Above all, the Gran Hotel Camaguey offers perfect hospitality, welcoming rooms and perfect city center location from which to discover the city’s streets, squares, museums and other places of historical interest. Our booking process is unique because it shows the best rate from all of these for Gran hotel in Camaguey and the types of rooms available. Our Gran Hotel Camaguey rate comparison is an industry first for Cuban Hotels. Once you’ve compared the rates, finalizing the booking at Gran Hotel takes just seconds and an immediate confirmation is provided in real-time. Hotel Isla de Cuba is located in the epicenter of Camaguey’s glorious architecture and vibrant streets. A perfect base from which to explore celebrated Camaguey and see the city centers major sights. Hotel Isla de Cuba Camaguey offers 42 comfortable rooms and besides its 2 star status, is perfectly adequate and clean. Discovering Camaguey, both day & night is guaranteed from the moment you step out of the hotel’s lobby onto the street. Hotel Isla de Cuba Camaguey also has a popular bar & restaurant and brightly decorated interior. All rooms at the Hotel Isla de Cuba offer standard facilities such as satellite TV & air-conditioning. Our booking process is unique because it shows the best rate from all of these for Isla de Cuba hotel in Camaguey and the types of rooms available. Our Isla de Cuba Camaguey rate comparison is an industry first for Cuban Hotels. Once you’ve compared the rates, finalizing the booking at Isla de Cuba Hotel takes just seconds and an immediate confirmation is provided in real-time. Hotel Islazul Plaza Camaguey is located in the Quinones district of the city just 3km from the city center. Open in the early 20th century the Hotel Plaza is the oldest hotel currently operating in the city. Thankfully, the hotel still maintains most of its original architecture and offers a glimpse into this historic period of architecture in Cuba. An ideal central location means that visiting the historic city center is easily achieved on foot. the city. Amongst the hotels numerous famous guests is the Chilean poet Gabriela Mistral. The hotel also holds the accolade as being the location of the first radio broadcast outside of Havana. Friendly and appealing, Hotel Islazul Plaza Camaguey is known for its hospitality and attention to detail. The perfect geographical location, at the intersection of the city’s two main streets, means that guests have probably the best base from which to discover this emblematic Cuban city. Our booking process is unique because it shows the best rate from all of these for Islazul Plaza hotel in Camaguey and the types of rooms available. Our Islazul Plaza Camaguey rate comparison is an industry first for Cuban Hotels. Once you’ve compared the rates, finalizing the booking at Islazul Plaza Hotel takes just seconds and an immediate confirmation is provided in real-time. 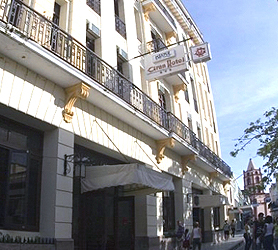 The Hotel Camaguey is a four storey property located in the center of Camaguey City. 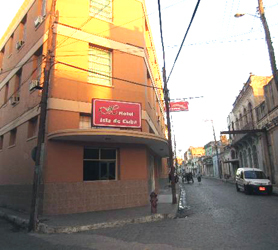 Hotel Camaguey is located on Cuba’s major road artery of Carretera Central (Central Highway), in the sleepy precinct of Jayama, just 4 km from the historical city center of Camaguey. For those arriving by plane, the Hotel is just 10 minutes from the Ignacio Agramonte international airport of the city. Due to its main road location, getting to Santa Lucia’s Beaches is essentially a straight 102km road. Inaugurated in 1975, the Hotel Camaguey was built in the modern high-rise 70s style and has received subsequent updates over the years. Hotel Camaguey offers and onsite art gallery featuring local artists and a lively Cabaret – Nightclub also called “Camaguey”. 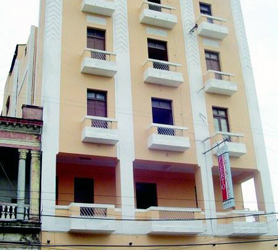 Due to its city center location the hotel is ideal for trips to places of historic interest around the city of Camaguey. The hotel offers a free minibus to transport guests downtown with a mini-tour of the city on the way. Our booking process is unique because it shows the best rate from all of these for Camaguey hotel in Camaguey and the types of rooms available. Our Camaguey Camaguey rate comparison is an industry first for Cuban Hotels. Once you’ve compared the rates, finalizing the booking at Camaguey Hotel takes just seconds and an immediate confirmation is provided in real-time. Hotel Puerto Principe Camaguey was constructed in 1943 and is located in the historic Puerto Principe barrio of Camaguey. Standing tall on Camaguey’s central avenue in the city’s old quarter it’s a perfect base from which to discover this historic city. 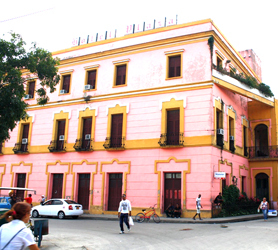 Further local attractions in close proximity are the Ignacio Agramonte Provincial Museum and Funda del Catre alley, officially known as Ramón Ponte Street, it’s the narrowest street in Cuba. Hotel Puerto Principe Camaguey offers spacious and comfy rooms with views over the avenue. Guests will find endless possibilities of discovery in Camaguey, the city of 12 churches, colonial mansions, streets and pathways. Architectural marvels in the area include various edifices displaying Hispanic-Arab style facades. For those who’d prefer to explore further afield, the Camaguey provinces offers the beautiful beaches of Santa Lucia, charming cays of Cayo Romano and Cayo Sabinal and, of course, abundant nature. The Hotel Puerto Principe Camaguey is also a discotheque venue with its popular rooftop Dance Club, a favorite nighttime venue for “Camagueyanos” and tourists alike. The disco is excellently soundproofed so please don’t let this deter you from staying at the marvelous Hotel Puerto Principe in Camaguey. Our booking process is unique because it shows the best rate from all of these for Puerto Principe hotel in Camaguey and the types of rooms available. Our Puerto Principe Camaguey rate comparison is an industry first for Cuban Hotels. Once you’ve compared the rates, finalizing the booking at Puerto Principe Hotel takes just seconds and an immediate confirmation is provided in real-time. Looking for a Hotels in Camaguey Cuba? Below is a complete list of hotels that are actually in Camaguey. 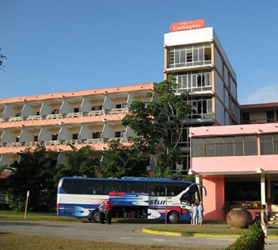 This list of Hotels in Camaguey only includes those hotels which are in the city center and province. This includes: Historic Unesco Center, Playa Santa Lucia, Nuevitas and Camaguey Province. Booking Camaguey Hotels with our Fast Booking program means you can check rates on all Hotels in Camaguey and compare rates across all suppliers. Booking your Hotel in Camaguey is then simple. Choose the hotel, best rate applicable and confirm using any major credit card from any nation. Your credit WILL NOT be charged until check-in and there is no need to take the credit card used in the booking process with you to Cuba. All Camaguey hotel Reservations are 100% guaranteed as confirmed with the hotel and a confirmed booking code is issued directly from the hotel. Below is a list of every hotel exclusively in Camaguey. You are guaranteed the lowest rate on your Camaguey Hotel stay along with payment in 32 currencies including USD, Euro, CAD, Yen, and many, many more. The list of Camaguey Hotels is divided into city center, Nuevitas and Santa Lucia area Hotels. Immediate confirmation of all Hotels is assured if available right now. Book your Hotels in Camaguey now to avoid disappointment. The closest major airport to Camaguey, Cuba is Ignacio Agramonte International Airport (CMW / MUCM). This airport is 10 km from the center of Camaguey, Cuba. Need to Rent a Car in Cuba Airports? Need a Hotel or Casa Particular in Camaguey? Are you looking for cheap flights to Cuba? 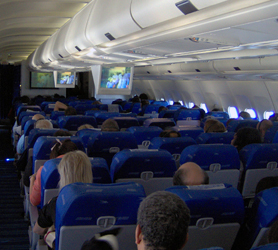 Immediate confirmation of your flight to Camaguey Cuba is just 2 clicks away. We also offer a price comparison of all available airlines to Cuba and Camaguey to allow you to get the best flight deals to Cuba right now. Our Cuba flight checker is free and can help you plan your vacation budget. Once you have booked your flight to Camaguey Cuba, you can conveniently book your Camaguey Hotel, Camaguey Car Rental or any other service on this one website, we are also available on our chat system should you need any personal help with your travel to Cuba or to coordinate your whole trip to Camaguey. We also offer VIP arrival services, airport transfers and much more, just ask us on our chat system and well coordinate your whole trip for you! A Casa Particular in Camaguey or home stay in Camaguey City Center or just outside Camaguey will ensure you experience both the wonders of Camaguey’s amazing culture, immersed in one-on-one contact with your Cuban hosts in the UNESCO acclaimed city. Learn about Camaguey’s rich history, in unison with true Cuban hospitality. The proprietor’s of your casa particular in Camaguey speak fluent English and have a profound knowledge of the city and its many sights. Any questions you wish to ask will be answered instantly by the Cuban family you are staying with. Some of our casa particulares also offer meals and drinks, meaning you’ll get to try some authentic Cuban food also. Here is a list of just a few Casa Particular in Camaguey which can be reserved online through us. The Camaguey Cuba Mobile network coverage is excellent these days. Some areas of Camaguey may offer limited coverage, including the road towards Nuevitas and, around 15 KM before Santa Lucia on the main road but, everywhere else it’s very good. Unless you use a US mobile operator it’s more than likely that you will be able to use roaming in Camaguey however, this can work out to be VERY expensive. Staying connected in Cuba at a better rate will mean obtaining a Cuba SIM Card throughout your stay. Using cell phones in Cuba and Camaguey is then much like anywhere else in the world where you can purchase Cubacel prepaid SIM card and use this anywhere in Cuba. You can purchase these prepaid Cuba SIM cards at the offices below and also recharge the phone with credit at these locations. Also, many hotels and stores in Camaguey offer prepaid recharge cards should you need to do this on the go. 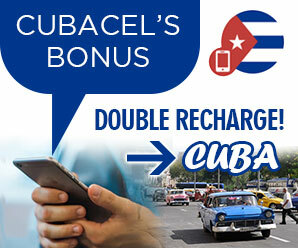 If you have a credit card there are often Cubacel double recharge offers but to obtain these you will need to go on the internet as they are never available directly at Cubacel Offices in Camaguey Cuba. GPRS, Mobile Internet & 3G connections can also be used in Camaguey Cuba. Cuba offers mobile internet to cell phone users with almost 100% national coverage but, this is more expensive than you are accustomed to and the network can be slower in Camaguey Cuba than other countries. If you decide to take your own mobile phone to Camaguey Cuba, please be aware that it will need to be unlocked and operate on the 900 to 1800 MHz GSM frequency. Almost all mobile phones produced since 2005 are quad band and as such will work but, please check your owner manual to avoid problems when you’re in Cuba.